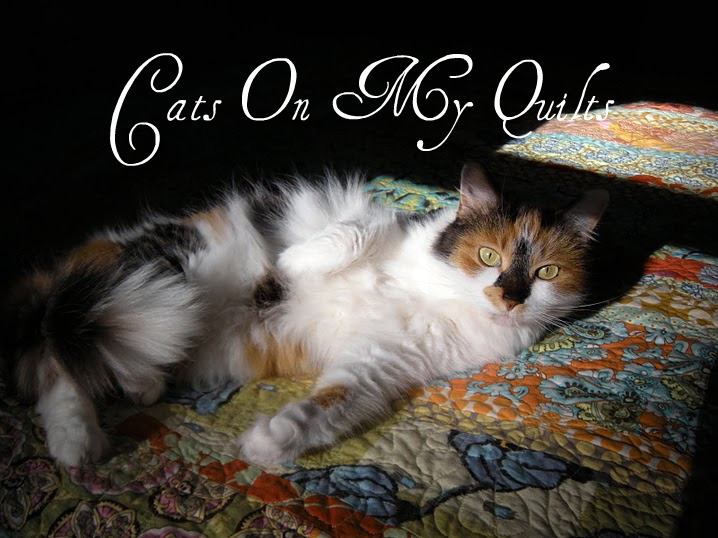 Cats On My Quilts: Out of Commission? Here in NH today fall feels like it has arrived! I have the fireplace lit in my great room to take off the chill so I'm starting to get out a few fall decorations. I just finished this runner for my kitchen island. I have made this pattern before-it's one of Heather Peterson's designs-and I love it. Nice and long and it fits perfect here. Then I gathered up any quilt with a fall look and put it on my quilt ladder for some great color and fall design. I'll get the rest of the fall stuff out tomorrow. One of the reasons I am trying to get things out is because I am going to be out of commission for a bit here. I am having some surgery on Monday, (nothing serious) and I know I won't feel like doing any of it after that. So it will be nice to come home from the hospital and see some pretty fall things out. So hopefully I'll be back blogging soon and have tales to tell. See you soon. Everything looks fantastic! Here is to wishing you a speedy recovery and a wonderful looking home when you return. Your fall decorations are beautiful. Good luck with surgery and take good care. Good luck with your surgery. Have a relaxing recovery. I hope your surgery goes well. I love the runner . I have been looking at that Little Charmers pattern for a long time, deciding whether or not I should make it. Your is lovely. It's such a great pattern to really showcase cute charms without chopping them all up to pieces. Your fall quilt ladder is cute! I forgot to add....Good luck on your surgery Monday! Looking like fall! Your quilt ladder looks wonderful. Hope you have a speedy recovery. I love it when fall is in the air, warm days with cooler nights. The runner looks great. Take care. I hope everything goes well for you on Monday. 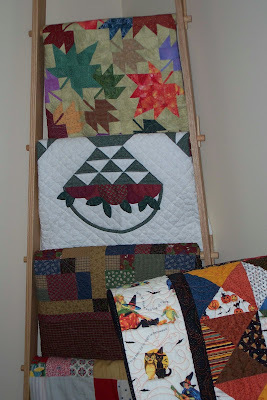 I love the quilt ladder idea to display your seasonal quilts. Love the fall colors... hope your surgery goes well! Love your fall quilts...could you send some cool fall air our direction please...I don't think Florida will ever cool off this year.Sending lots of good thoughts on Monday...you take good care! 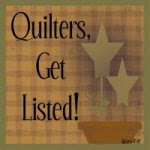 Your quilts are beautiful as always and I will be thinking of you on Monday sending good thoughts for a speedy recovery. I'm jealous about the fireplace weather already how great and snuggly for your recovery. Love your quilt ladder. Hope everything went well with your sugery. Hope everything has gone well for your surgery. Autumn is my favourite season of all!! I hope you are doing well after your surgery. I love your table runner. Like the ladder too.. You do wonderful work. Hoping you're continuing to recover well. Missing you. Hope all goes well for you today. 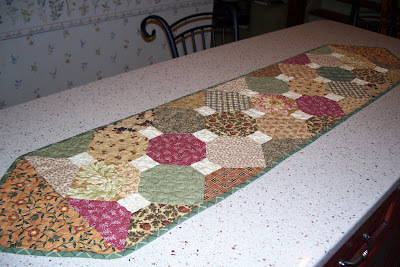 Your fall quilty thing look great.